some of my very favorites. Unfortunately, I've never been able to find out all that much about them. A couple of them I "inherited" from my older brothers, who I imagine got them in the early 1980s. Then, I found a couple more on my own at flea markets and the like over the years. 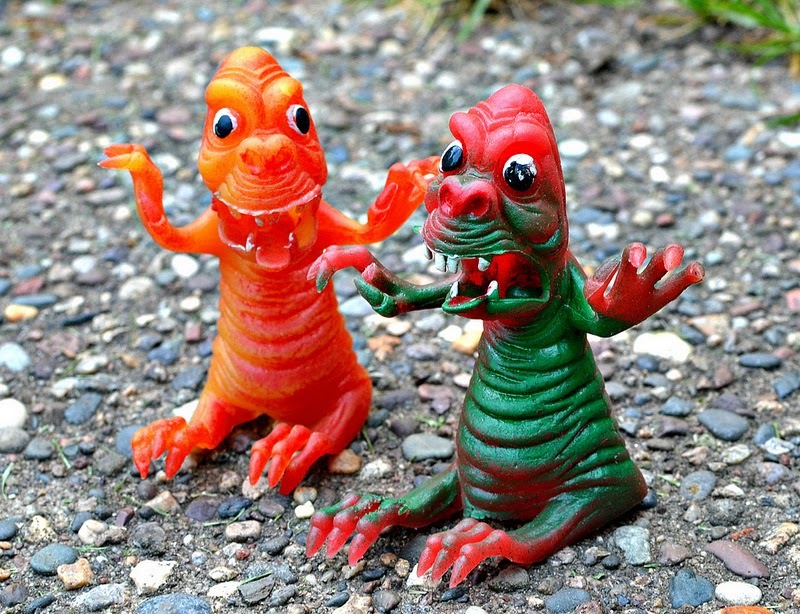 This group of lovable uglies is made of the soft rubber typical to jiggler toys of the '60s and '70s, and as far as I know consists of only the three different monsters featured in this post. They all appear to be a monster-dinosaur-animal mix, which of course is a winning combination. They're around 3.5 to 4 inches tall and are hollow underneath (sort of like oversized finger puppets). I have two of them in two different color schemes, although I couldn't tell you how many different color schemes exist in total. They're stamped with the words "Gigantor" and "1975 Steven Mfg." I assume that means they were produced by a company called Steven Manufacturing back then, although I'm not sure exactly what Gigantor means. I do know that I have a small rubber finger puppet that also has the "Gigantor" name stamped on it, so maybe it was a name given to a larger set of jigglers by the company? If you have any additional information, please comment and let us know! I think this is my favorite, although it's hard to choose. He appears to have some gorilla in him, although really, who the hell can tell what he is besides a totally awesome monster. I love his face, which looks like it's experiencing a combination of terror, anger and complete shock. I also really like how the orange and red rubber is translucent. It makes them look extra cool. This dude is some bizarro combination of a crocodile and a centipede. Check out how shifty this guy looks. He's clearly planning what (or who) to sneak up on for his next meal. Really pretty creepy. I don't believe I've ever seen this one in a color scheme other than brown and green (but that doesn't mean it doesn't exist). 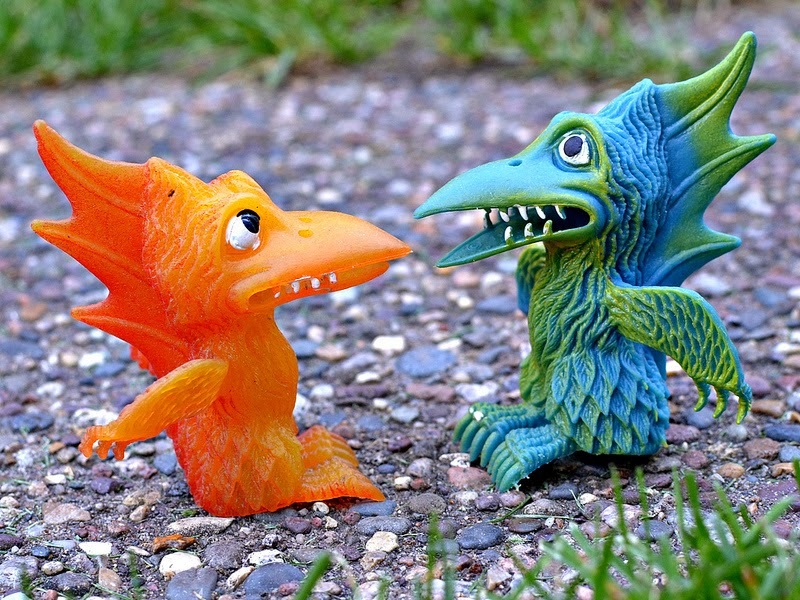 These guys are wacky pterodactyl monsters. The detail here is especially fantastic. Just look at all the texture on the body and how the painted parts accentuate it. I like how you can stick MUSCLE men or similar figures in their beaks and make it look like they're chowing down on 'em. Man, I love these things. What about you? What do you think of the Gigantor monsters? UPDATE: Below is a photo of the finger puppet monster I have that's also marked with Gigantor. Man, I wish I had me some jigglers or uglies as they're sometimes called! 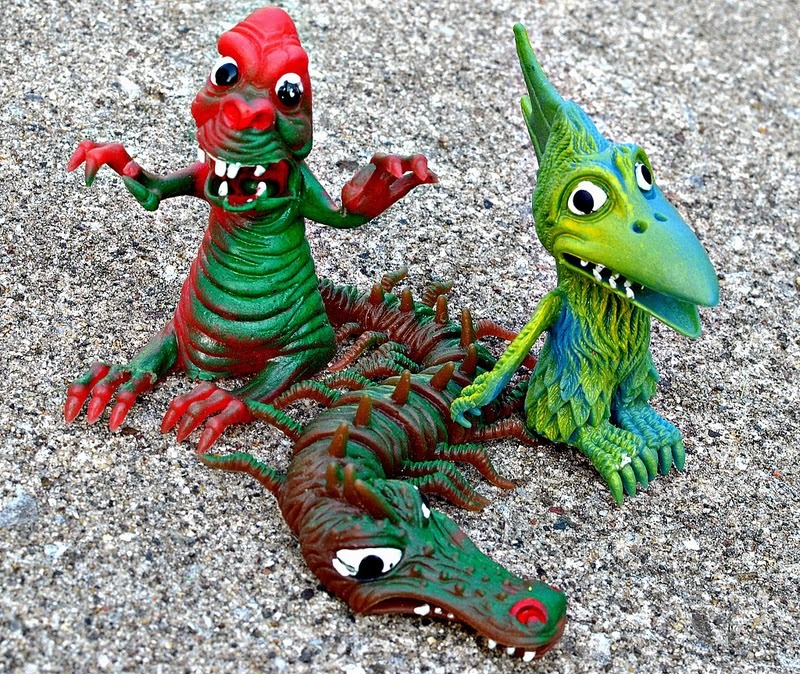 I did some "research" (Google searches) on them after seeing some cool monster toys on The Goodwill Geek's blog (http://goodwillhunting4geeks.blogspot.com/2013/11/goodwill-grab-bag-monsters-and-mayhem.html). I also searched eBay, but it's hard to find these guys on the cheap. Cherish those little Uglies, they're amazing! Yeah, I have some some on eBay for crazy prices, but they always seem to sit at those prices. Hopefully you'll be able to find some soon! These guys are quite a bit bigger than the Rubber Uglies, I think. I've had that first one (the gorilla-shaped one, in red and green) for as long as I can remember - he was always the "boss" of my other finger monsters. For the last few years I've assumed he was from a line called "Gigantor", although looking through my bookmarks to find out WHY I thought that, it turns out I got the information from your Flickr set. Whoops! Haha, gorilla-monster does make a good "boss." Yeah, they all fall under the "Gigantor" name, but as I mentioned in the post, I don't know if that's supposed to be the name of the specific line or what. I'm familiar with the cheap Hong Kong ones but have never encountered these, they look to be of a better quality and must have been the 'original' inspiration for the countless clones. There was a set of four of these (HK clones) in one of our major supermarkets here in the UK - If you'd like, I'll grab you a set if I see them again? Yes, I would definitely be interested in any knockoffs of these if you find them again...thanks! 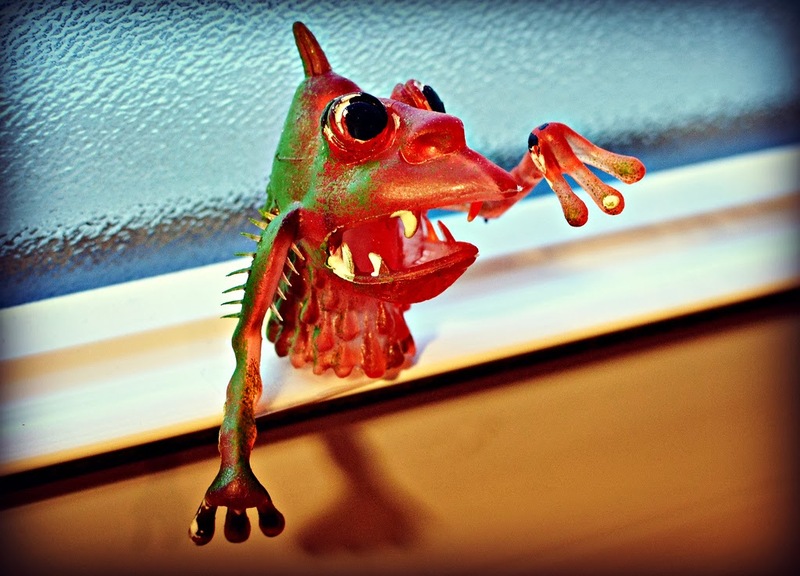 I had that last finger puppet you have shown when I was a kid - he was so cool! I once contacted Steven Mfg. directly in order to solve the riddle of my Rabbagator - I have their contact info on my blog devoted to Mixed Up Zoo Animals: http://rabbagator.blogspot.com/ - if you want to get to the bottom of these, I suggest you contact them and see if they can help you out! 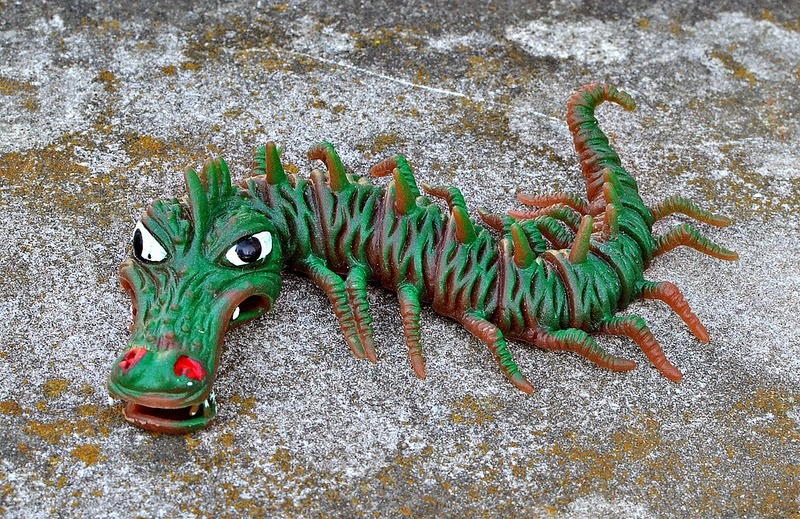 That alligator/centipede reminds me a lot of the Rabbagator, I may need to track one down! Thanks for that! When you called them were they able to give you any info? They had old catalogues on hand and were able to flip through them and verify for me the number of different figures in the line, as well as giving me the exact name of the toys (Mixed Up Zoo Animals) and some anecdotes about their creation. The lady I spoke with was super helpful and friendly. It was many years ago when I called, today they may be able to do you one further and email you a catalogue scan or something. Worth a call in my opinion! Cool...thanks again for the info! When I was a kid in high school the type at the bottom were in EVERY corner shop. On the way home I used to spend my remaining lunch money on them, and as they only cost between 10 and 20p each I had hundreds at one point. Sadly they went the way of my almost complete Mini-boglin collection... I HAVE NO IDEA! They just vanished! That's sad! Hopefully they're not gone forever and you dig them up one day. I actually did! By a weird coincidence I was getting some photos down from the attic and found a few in a box of toys in the corner of the attic. Only about nine of the finger puppet type, but they're all without any brand print so all knock-offs. More importantly the box also had about sixty of my mini-boglins. It might only be a small number of what I had as a kid and a few are a bit worse for wear, but maybe the rest are tucked away in a dark, cobwebbed corner of the attic. For now I've cleaned off all the dirt and stored them in a bucket next to my MIMPs. I have the pterodactyl finger puppet, from 1975, also stamped gigantor with the Steven toy logo. Are ppl buying these? The gorilla-ghoul was our favorite, too (me and my brother). We had two of him.